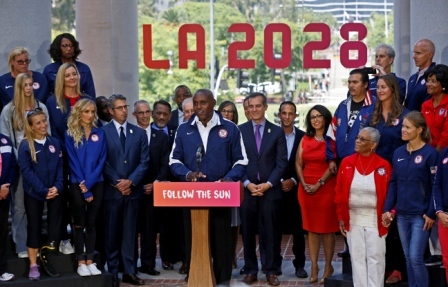 The Olympic cauldron blazing above the Coliseum gave it away: Los Angeles will host a third Olympics – in 2028. 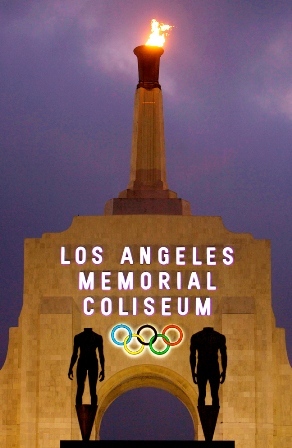 Other than an L.A. 2028 sign posted at the Coliseum, there were no festivities at the site of the opening ceremonies in 1932 and 1984. A homeless man pushed a shopping cart past the black iron gates and a few people strolled by on their way to visit museums in Exposition Park south of downtown. Mayor Eric Garcetti and other city officials have said their proposal can stay within budget by relying on the region’s many existing stadiums and arenas, including the Los Angeles Memorial Coliseum and Staples Center. The bulk of the revenue for the L.A. Games is expected to come from ticket sales and corporate sponsorships. Naber noted that the athletes' village came about at the 1932 Games and in 1984 Los Angeles used sponsorships to make the games affordable and recruited a huge volunteer corps. “The world mecca of delivering a message and telling a story, that’s here,” he said, noting Hollywood’s involvement in the city's bid.